Sabarimala Temple Festival, which is held every year between the months of November and January, is dedicated to Lord Ayyappan. The ceremonies and rituals connected with the festivals take place within the sprawling precincts of Sabarimala Temple - located atop Sahayadhri Mountains (almost 3000 feet above the sea level) in the southern state of Kerala. Sabarimala Sree Dharma Sastha Temple, which is the main Sastha temple in Kerala, is dedicated to Lord Ayyappa and bears testimony to religious harmony. The shrine attracts more than 4 million devotees from across India and abroad and is one of the most revered pilgrimage centers in Kerala. 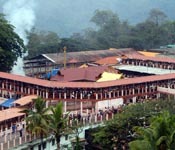 Sabarimala Temple is open for the general masses only during the days of festivals –which are namely Makaravilakku, Mandalapooja, and Chitra Vishu. Before starting their pilgrimage, devotees have to cleanse their body, mind and souls by fasting for 41 days. Girls who have not yet reached their puberty and elderly women who have attained the stages of menopause are the only females allowed inside the temple. The male pilgrims are expected to sleep on the floor, walk bare feet, wear black clothes, keep their hair and nails uncut and abstain from self indulgence during this 41-day vratham and their journey to Sabarimala. During the period of fasting and pilgrimage, devotees stay away from all cardinal pleasures, perform ablutions during the morning and evening and practice strict celibacy. They can be seen setting out in groups with a bundle of cloth or Irumudi kettu containing offerings such as camphor, ghee, coconuts and rice.The journey is tough and takes pilgrims through toilsome paths and trails in the forest. During the time of festivals, vehicles ply up to Pampa and thereafter the worshipper traverse all the way up to the Sabarimala Temple on foot. The call of refuge and dedication in Lord Ayyappa or Saranamvili is one of the most essential elements of daily worship for these pilgrims. Located on the eastern side of the sannidhanam is 'Vavarnada'—which commemorates the life of Vavar, a Muslim devotee of Lord Ayyappan. Unique in various aspects, the temple is visited by devotes of all castes and religions. Standing stoic in the history of Kerala, the Sabarimala Temple has always been an epitome of truth and has ranked among the main shrines of India. Dedicated to its presiding deity, Lord Ayyappan/ Dharma Sastha/Ayyanaar, the temple was founded by the famous warrior-sage, Parasurama—who was responsible for reclaiming the rich land of Kerala from the seas. The temple belongs to the set of five 'panchashastha' temples - Aryankavu, Erumeli, Sabarimala, Kulathuppuzha and Achankovil. These temples were established to fight various destructive elements and protect the people and state of Kerala. Lord Ayyappan/Dharmashastha is believed to be in a state of eternal Samadhi or bliss and is a brahmachari holding 'chinmudra'. The Lord had chosen this tucked away abode to perform his meditation after vanquishing the powers of Demon Mahishi. The temple is surrounded by 18 hills and dense tropical jungles and is accessible only during mandalapooja (November to January), Vishu, Makaravilakku and the first day of each month of the Malayalam calendar. The most important festival celebrated at Sabarimala is Makara Vilakku. This seven days festival commemorates on the day of Makara Sankranthi. According to legends, the famous idol of Dharma Shastha was enshrined inside the temple on this very day. The festival of Makaravillakuliterally translates into the words Makara-which is a Malayalam month) and villaku or lamp. It is said that Lord Ayyappa was born through the unification of Lord Vishnu (as Mohini) and Lord Shiva. The Temple is an important symbol of unity between Shaivites and Vaishnavites. Three days prior to the celebrations, the jewellery adorning the idol is carried from Pandalam Palace to the Temple in a ceremonial procession. This procession arrives at Sabaripeettam on the evening of Makara Sankranthi and is then led into the Sannidhanam along with music, beating of drums and lights. As folklores go, a kite appears in the sky during this time to safeguard the precious gems and jewels of the Lord. One of the other important highlights of this festival comprises of the “Makarajyothi”, which makes its appearance during the festival of Makara Vilakku. This celestial light appears in Ponnambalamedu—the mountain ranges facing the temple and is believed to fetch good fortune upon devotees who manage to view it. The celebrations associated with Sabarimala Temple festivals usually begin on Makara shakranthi (around January 14th), when the Thiruvabharanam or sacred jewels of the deity arrive in three boxes. The mountains echo with the loud chanting of “Saranam Ayyappa’, as millions of devotees surge forward to revel in the much awaited event. The person carrying the jewels is in a state of strange trance and dances throughout the journey from Valiakoikkal Sastha temple at Pandalam to the Sannidhanam. The sacred jewels are received by Thandhri and Melshanthi at the Sannidhanam, amidst the echoes of Sarana ghosham. The priests adorn the idol of the lord with these jewels and the event is followed by a Maha Aarti. As a dazzling flame of light appears in the sky over Kantamala (home of devas and rishis), the pilgrimage comes to a conclusion for the devotees. After the appearance of the jyothi, Malikappurathuamma arrives in a pompous procession amidst drummers, torch bearers and buglers to Patinettampadi (18 steps) and then returns back to her shrine. This marks the commemoration of the Makara Vilakku which then lasts for seven days. Several pilgrims stay back at the Sabarimal temple for this festival and perform Kuruthi pooja (where an offering of turmeric powder and chunnambu mixed with water is offered to the deities of the forest). On the last day of the MakaraVillaku Pooja Festival, offerings are made to the Lord in a special celebration known as Guruthi. As per customs, nobody is allowed to remain in the temple premises after Guruthi. Mandalapooja, Onam, Vishu and Pankuni Uthram are other magnificent festivals celebrated at the Temple with a lot of opulence and show. The main rituals are performed on Makara Sankrathi and upon the starting and closure of the Mandalam pilgrimage. Four sacred pujas are conducted daily along with a host of other special rituals.Prime among them are the Usha Puja (Worship done in the morning), Ucha Puja (rituals of the afternoon), Abishekam (pouring of libations) and Padi Puja (when special aarti is held at 18 holy steps at night). The temple is heavily laden by the smell of camphors lit by devotees and pilgrims. Neyyu-Abishekams (pouring of ghee) and the other Abishekams are considered highly sacred along with Pushabishekam (offering of flowers) and Bhasma Absihekam (pouring of ash). These offerings are then distributed among the devotees present in the temple. The Mandalam pilgrimage requires devotees and pilgrims to consume selected types of food and stay away from alcohol and other beverages for 41 days of severe self abstinence. The Prasadam distributed and bought by devotees during Makara Vilakku and other festivals comprises of Appam—sweet dumplings and Aravana—which is typically a sweetened thick black dessert prepared from jaggery. Various governmental agencies and organizations distribute free food and meals to the devotees during the festivals.